Developers of the upcoming action-RPG, Lords of the Fallen, have released a couple of screenshots to satisfy the public's appetite. For anyone unfamiliar, the gothic-looking title is the brainchild of Tomasz Gop, the executive producer of the first two Witcher games. We first heard about the game last year, when Eurogamer secured an interview with Gop about his ambitious project. "It's a challenging game, action RPG, which means a lot of advanced combat,” explained Gop. "When you walk through a location, and you have to fight 10 enemies, that takes around an hour.” He classified Lords of the Fallen as a mixture between Dark Souls and Borderlands, containing a challenging combat system that is laced with character customization and skill trees. The game is under development by the German studio Deck 13, but will be produced by City Interactive, which created Sniper: Ghost Warrior 2. These screenshots are very Witcher-esque, boasting some very impressive visuals and lighting effects. We are not aware of which platform was used to create these stills, but the game will be developed for Xbox One, PS4, and PC. 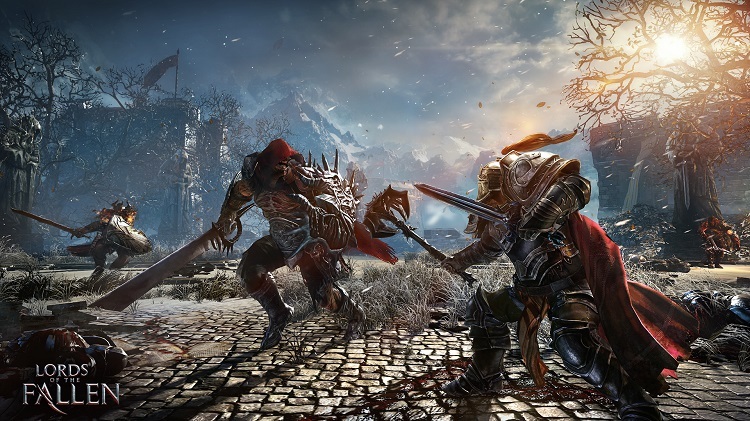 Lords of the Fallen is due out sometime later this year, barring any setbacks or delays. We don't yet have a solid release date, but these screenshots should help to keep your eyes entertained until we hear more.